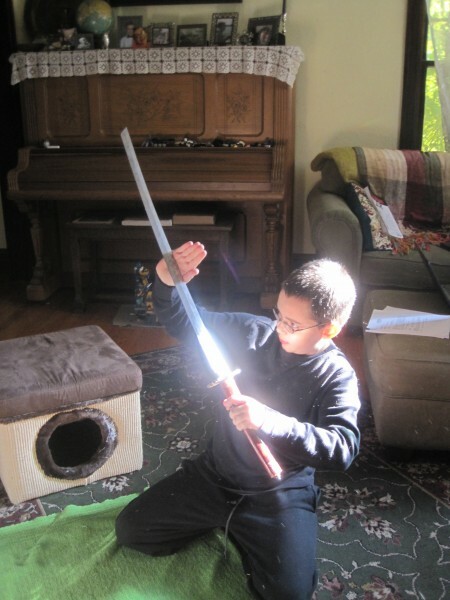 We had to make a stop at Walgreen's on the way home from swimming, so we were driving down Fairview this morning and out of the corner of my eye, I see a guy next to a sign that said "RUMMAGE SALE" holding a katana. I was like, "Oh, my god, you guys, we have to stop!" 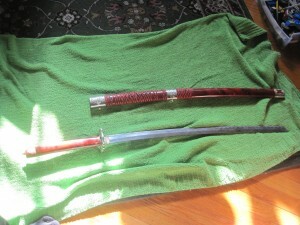 So, we quick pulled into our bank, took out twenty dollars and debated whether the guy I saw was leaving with the katana, whether there might be others, and how much we'd be willing to pay for it, if it turned out to be the real thing. I said I'd pay twenty bucks. Shawn thought I was insane. Mason was bouncing in the back. We got turned around, parked, and ran out of the car. The katana was still there. It was marked for... a whole dollar. One buck. Looking at it, I thought, "Okay, this is clearly some cheap souvenir, but it's got some serious heft to it." The lacquered sheath was red (which is not unlike Renji's, though to be fair, his sheath is black, and only the ribbons are red, but WHO THE F*CK CARES FOR A BUCK??!!) The blade is steel. There are lots of cheesy dragon decorations on it, but one of the decorations is a tiger with lightning strikes coming out of it. And, when I saw that, I was like, "This is... destiny, man. Fate!" So, we bought it. Shawn stayed long enough to walk off with several other items, all of them severely under priced for what they were worth and Mason and I just danced in a circle singing, "A katana! 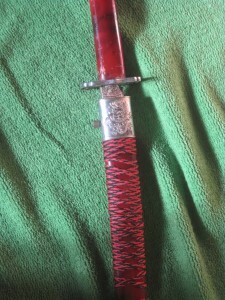 A katana! A katana!" So, I said to Mason in an awed whisper, "So, we should probably ask it its name....right?" He gave me an eye roll, but a fond smile and said, "You're such a GEEK, Ima." A heartbeat later, he added, "Yeah, we totally should."